You can see now that the 2nd metatarsal, which is quite a fine bone, is bearing far more weight than it should. This can lead to pain in the 2nd, 4th or 3rd metatarsals (in order of likelihood) as the bone bears too much pressure and becomes bruised. If it goes too far, the bone can break at its weakest point which is called a stress fracture. This can occur in anyone but is especially likely in women after menopause. With the 1st metatarsal in the up position, the big toe can t pivot around the metatarsal as it should as the topside edges of the two bones jam into each other. This leads to a lot of pressure in the joint. Depending on the physical shape of the bones, it is this forceful grinding that will cause extra bone to grow around the joint. Under one set of circumstances, a bone bump grows to the side, the 1st metatarsal starts to pivot away from the foot and the big toe crowds in towards the 2nd toe. This is called a bunion or hallux abducto-valgus or HAV. Under other conditions, the bone collar will grow around the topside surface of the 1st joint. This will lead to a permanent limitation to how far the toe can bend. 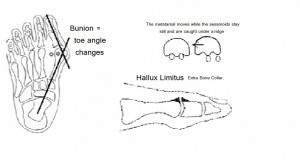 This condition is called Hallux Limitus (HL) and, while it doesn t look as troublesome as a bunion, it is actually more debilitating in time and often results in lower back pain and stress fractures to the forefoot. The sesamoids are two small bones, a bit smaller than the last joint of your smallest finger. They sit under the 1st metatarsal bone as shown in the diagram. Both HAV and HL can cause the sesamoids to hurt. In a bunion, they are displaced as shown in the diagram and get stood on by the middle ridge of bone. The forces involved in all of these problems are very strong, making them difficult to solve. As a rough guide, the podiatrist will be able to cure sesamoiditis, pain in the ball of the foot and prevent stress fractures. HL can be stopped where it has progressed to when treatment starts, but cannot be reversed without surgery. Despite this, no matter how painful the HL joint can get, eliminating the pain is usually quite simple and surgery can almost always be avoided. For HAV, elimination of pain within the joint is usually achievable. Unfortunately bunions don t respond as well to treatment as the other conditions and progression often can t be stopped but rather slowed to half speed. For example, the growth of the bunion over the next 10 years without treatment might take 20 years to come about with care. This sort of delay could well mean the difference between needing surgery eventually or not. As indicated above, the treatment needs to be extremely specific to each foot. One-size-fits-all inserts from the chemist are not suitable for these conditions. Bunions, Hallux Limitus, Sesamoiditis, Stress Fracture, Metatarsalgia.